The surprise of it: I had left the kitchen only a moment before. 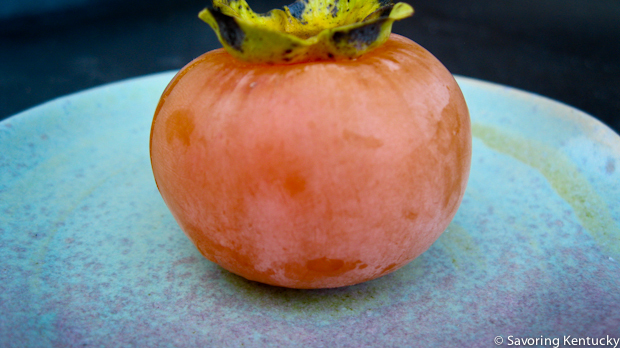 Now I came back in for some ordinary task and faced the extraordinary—a Kentucky persimmon at the end of our counter. Old love from my past: meet my present life. It was definitely a persimmon, like the walnut-sized ones I loved sharing with my parents in beautiful Wayne County. Like the bloomy-skinned ones I had picked up along Burnett Hollow Road for years, until an enterprising farmer cleared the fence rows and cut down the precious source. Like the sweetly seedy ones that make me so happy at Snug Hollow Bed and Breakfast. Three years ago, when I helped plant young persimmon trees in the London Ferrill Community Garden and Orchard, I had not expected them to thrive, and certainly not to bear fruit so quickly. I did not have a lot of faith in the small bare root slips we planted on a cold March morning in 2009. Honestly, until the persimmon arrived on my kitchen counter, now that I live in a city, I had resigned myself to a life without this special fruit. All previous persimmon eating had depended on trees in the wild, and all the wild trees I knew in childhood and loved through mid-life had disappeared. Three years of nature's work changed everything. Right in the heart of this sweet city, we now have magnificent Montmorency cherries in spring and persimmons in fall. We will have them on into the future, I hope and trust. Each of this year's two fruit surprises plucked fruit-flavored strings that connect my urban life to my parents' agricultural lives and their parents' lives and on back through time in this food haven called Kentucky. I welcome these tastes back into my life, along with all the rich memories the juicy flavors evoke. I again credit the foresight and sheer tenacity of my dear friend, our neighborhood "minister of food and gardening," Sherry Maddock. Because of Sherry and the neighbors who have planted fruit trees, nut trees, and brambles throughout the Martin Luther King Neighborhood, I may soon stop being surprised at the fruitfulness of our center-of-the-city home, and simply slurp the bounty.